The construction of three mega dams in Malaysia has displaced tens of thousands of people and forced them into resettlement areas. A stunning video from The Borneo Project shows a rather terrible reality, where current plans to construct twelve additional dams in the region of Sarawak will displace many thousands more. Learning from what happened to affected communities with previous mega dams in the country, including loss of livelihoods, land, culture as well as sacred places and cemeteries, people don’t want more broken promises. 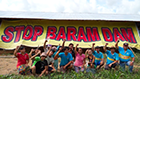 Communities are still resisting the implementation of new dams and are decided to prevent them. As one of the villagers says: “If you have land, you live. Without land, you die”.